This is where the DNA Match Labeling extension for Chrome comes in! I worked with a programmer to build this extension. The extension can be found at the Chrome Web Store (click the link or search for “DNA Match Labeling” in the store). Click on “Add to Chrome,” give it the necessary permissions, and it will be added to your Chrome browser. Once installed, you’ll see a new table at the top of each kit you admin at AncestryDNA. Each kit you admin in your Ancestry account will have its own unique table! Here’s my table. You’re now ready to fill in the dots with color! Now, when I assign a red dot to a match, I am indicating to myself that the match is related to me through my paternal grandfather Roy Bettinger. Similarly, if I assign a yellow dot to a match, I am indicating to myself that the match is related to me through my maternal grandmother Jane Garcia. I can also change the color, including back to empty white, on either the main match page or in the individual match. One of the best benefits of the DNA Match Labeling tool is as a very clear visual indicator when using the AncestryDNA Shared Matches tool. 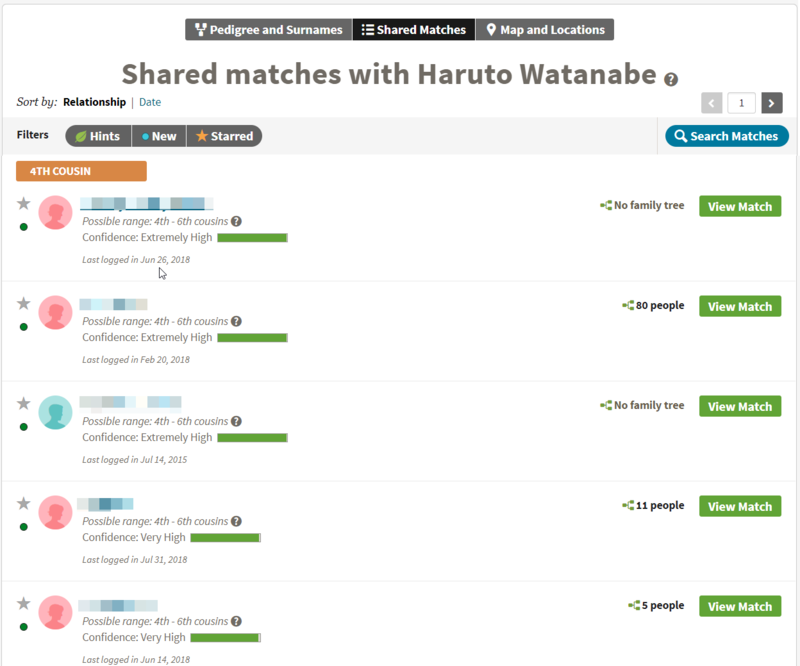 In this example, I’m checking for matches with Haruto, and I see that all of the closest shared matches have been labeled with the green color! I can instantly formulate a hypothesis that this match is related through the ancestor I’ve assigned to the green color! I’ve proven nothing, but it is an excellent hypothesis that I can now test with additional evidence. How are you using the tool? What discoveries have you made? The tool does NOT allow for sorting or searching using these colors. Additionally, if you label “John Doe 123” with a red dot in YOUR kit, that labeling will not carry over to the same “John Doe 123” in another kit. You also cannot add more than one color dot to a match. Typically this is a close relative related on multiple lines, in which case you typically know who they are. For cases of more distant pedigree collapse or endogamy, there may be creative ways to address this, such as assigning a color to a certain cluster or group of ancestors. The use of the tool is limited only by your imagination! Additionally, my apologies to those with color vision or small dot vision challenges. If I were redoing this from scratch I would use colored shapes with eight different shapes each being a different color. Unfortunately, the time & cost investment made so far has made that currently infeasible. These all might be something for a future update (although no changes are planned currently). You are so right: Ancestry DNA gives us a massive amount of data to look at and kindergarten-level tools for dealing with it. Maybe tools like yours will help encourage Ancestry to offer this type of thing natively — *with* sorting and searching. The heck with colors and shapes. I think this needs to be a user defined text field like “Smith”, “Jones”, “unknown maternal”, etc. And, yes, it ought to carry over between tests on the same account. 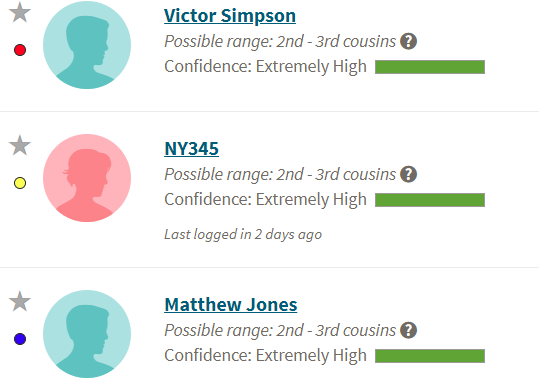 Even if Ancestry were to support searching on the contents of the existing comment field, this would help me a lot. Check out MedBetterDNA extension. It shows the notes field for each match on the list, though again not carry over between tests. I wish it did that as well. What a brilliant tool, I’ve been waiting for something like this. BRAVO!!!! A job well done and so helpful! Thank you! In MedBetter DNA filters, I currently use eight colored emoji hearts preceded by hashtags. I can change the color of hearts to match the dots in this extension, and use that extension for sorting. It isn’t as clean as having a sorting process within the DNA Match Labeling extension, but it will do. Would you consider adding sorting as a future enhancement? I would love to add sorting. It will be a substantial investment, but it would be very handy. Brilliant! and this does not affect the Ancestry blue new matches button because you used a different color, right? Hi Thomas! It does not affect the Ancestry blue new matches button. Thank you Blaine! It works great. I had a face-to-face meeting with Ancestry employees a couple weeks ago in Lehi, to give input, and some type of color coding for the different branches of one’s tree is one think I suggested. I also let them know, their DNA tools for working with our cousin matches are overall sub-parr compared with the competition, i.e. MyHeritage DNA who includes chromosome browser, triangulation, 5th-8th to 5th-8th cousin matching, and more. An entire new post could be devoted to enhancements we would all love to see at each of the different testing companies. The potential is enormous. I would much rather see a chromosome browser at Ancestry.com than the Spotify partnered tie in. Blaine, this is a great tool! I haven’t downloaded it yet because I saw somewhere that it’s only available on windows machines. My windows computer is my y primary workhorse for dna, but I also use an iPad Pro for some purposes. Will the dots show up on the iPad if I. Work with them on my PC? And could I also. Install the app and work with it on the the iPad? Finally, (assuming the app is only for the PC)if I. Install the app on my PC only, will it affect dna result display on the iPad? Hi Deborah! No, it will not work on your iPad, unfortunately. Thank you Blaine. I ‘m ok with yhat asas long as it won’t affect my use of it on the the pc. I’ll be installing Nguyen it shortly! Nice addition. Thanks. Now I can start mapping my DNA spreadsheet to AncestryDNA. This will be useful as I analyze more DNA results as I will have to jump back to spreadsheet less frequently to get my bearings. Thanks Blaine this will be very useful. One question…. Should the labelling show up if you set it up on one computer and then access it though another? I’ve labelled on my MacBook Pro. When I’ve logged into my iMac, the extension shows up in AncestryDNA but not the labels I’ve named or their assignment to my matches. Am I missing something? Eager to get going on solving some puzzles! Chris W – which FB group! I’m new to these groups. But even if I knew I have seen it somewhere, FB makes a lot of discussions go into Never-Never land after I’ve read them. I’m in the “Ancestry” group, although I don’t think it was a closed group. Very helpful! Thank you so much for all your hard work! Thank you for reading my mind and putting my thoughts into action. Looks like I’ve got sorting to do. I’d like to know what categories people found to be helpful using the color dot system. Grandparents with four color – or Great grandparents with eight colors – what would be the pros and cons of using 4 gp vs. 8 ggp? Also, will this color dot system be downloaded with the free Chrome DNA Matching Tool? Then possibly they could be sorted? Hi Blaine. I downloaded the chrome browser and obtained the DNA labeling app. But when I logged in to AncesteyDNA, the special table, dots, etc. did not appear. What step am I missing? Thanks. Blaine, I have the DNA Helper extention. And decided to just type in the name of the color in the note section, and can get a sort that way! And named my 8 colors but that seemed to make all the names on all my DNA matches mysteriously disappear to be replaced with “name unavailable”. I tried turning off and rebooting my computer but still no names. What have I done wrong and how can I get my names back so I can play with this great new tool? Will this nice tool work simultaneously with MedBetterDNA, which others described here? I have tried several times to download the DNA Match Labeling. Each time I click the “Add To Chrome” button, it changes to “checking” and then my computer freezes even though it does say that my computer is compatible. Does it make a difference if I’m using Ancestry.ca as opposed to Ancestry.com? I had seen in another post that it only worked on the American site. It functions on Ancestry.ca. Perhaps try logging out of Google/Chrome and back in, and/or clearing cookies. It’s been downloaded more than 4,000 times, so it appears to be fully functional. Good luck! I’m unclear on a point, however. It would be even more useful to me if the labeling and color coding were to carry over when I’m on a different computer. I use a laptop sometime and my iMac other times. Both Chrome browsers are logged into the same google account and they both synch… but for some reason, this labeling and color coding does not carry over to the other computer. So frankly, I’m just not clear how this info is stored and why it does not carry over to 2nd computer. I’ve inquired with the programmer about transportability, but it is currently beyond my budget. Is it possible that you could provide information about the location of the extension’s data files on my computer. I can’t find them, but, if I could, I might be able to back them up or transfer them to a 2nd computer. That wouldn’t be as good as storing them in my Cloud and accessing from multiple computers, but it would be a start. Blaine, do you also plan on an extension for Firefox? I too would prefer an extension in Firefox. I just don’t use Chrome at all. Woohoo! Thank you for this great tool, Blaine. I have tried to use this on my Samsung tablet, but it does not seem to work on tablets. It works on my laptop but I tend to use my tablet more. Is it designed to work on tablets? In addition to not transferring to other devices, it also does work when going to a match in any way than the list of matches. For instance, if the match was found via the “compare” function. Still, way better than what Ancestry has provided. Love the DNA Match Labeling! What are those blue/gray colored squares right above the “possible range” section above each name on the Shared Matches illustration of Haruto Watanabe? They range from 5 to 12 colored squares. Hi Elaine – that’s just pixelation from where I blurred the names. Will this feature only work with Chrome? Since this change my DNA list and relationships/CM’s, etc. is no longer showing. I have had the mark dissappear on some of my matches and I have to redo it. Am I doing something wrong? Will it work on a Mac ?